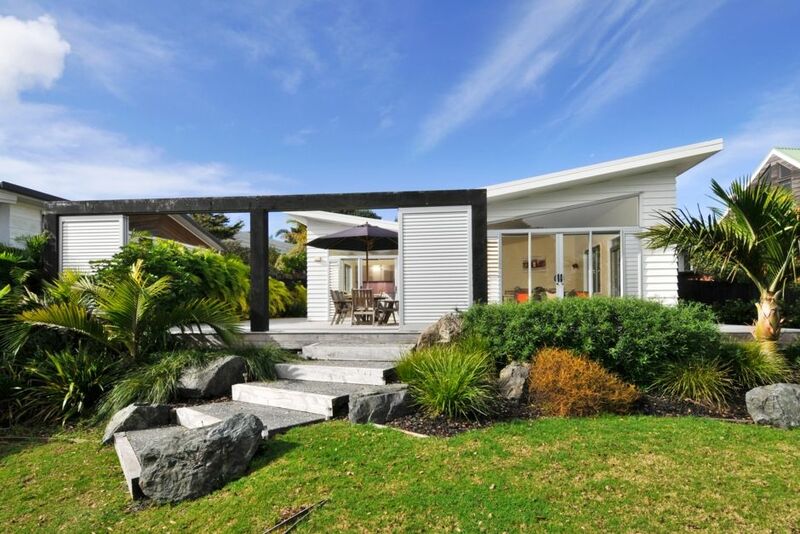 Welcome to our modern spacious Omaha beach holiday home. This stylish 4-bedroom home has recently been refurbished with quality and comfort in mind. The bedrooms are divided either side of a central double corridor, designed to provide you with a degree of quietness and privacy. Left corridor - is the master bedroom featuring a king size bed, large wardrobe, then a spacious bathroom with toilet and shower, followed by a second bedroom with two king-single beds. Right corridor - is the 3rd bedroom with a queen bed, a spacious bathroom with toilet and shower, followed by the 4th bedroom with two king-single beds. The design lends itself to 2 families or extended. You enter into a large open-plan kitchen dining area featuring a modern fully featured designer kitchen, perfect for entertaining. The kitchen has all the mod cons you would expect, including stone bench-top, gas cook-top and double draw dishwasher, Nespresso coffee maker and all the usual attributes - whether you want to cook for the family or entertain guests. We have tried to cater for everything you might need, including quality wine and champagne glasses, platters etc. You’ll find the 4-burner hooded BBQ freshly cleaned and ready for use. There is a separate formal dining area with 8-seat dining table and lounge with new sofas. There are flat screen TVs with My Sky HD featuring all movie and sport channels. A new stereo with USB and Bluetooth to stream your favourite music, using the free fast and unlimited Wi-Fi. You'll find books, magazines, family games, bikes and boogie boards to keep you entertained. The property has been extensively landscaped including palms and exotics. A new addition is an outdoor fireplace (firewood supplied). Imagine yourself sitting around the fire with a drink in hand, enjoying the warmth and the sunset view during the late afternoon and evening – just magic! Easter and long weekends minimum stay 3 nights. House was in a good location close to a good coffee shop. Easily located and good parking. Easy walk to the beach, and if you are a golfer course nearby. Such a great house to spend a week in through the new year period in build up to our son's wedding. Great location, light, airy and clean, well appointed with everything that you need for your stay. Loved that beach towels were supplied with the linen supply. Fantastic place for your holiday. Fantastic place for your holiday. All in this house are brand new. Very clean and perfect. The house overlooks the golf course with views out to the water, very peaceful. The house overlooks the golf course with views out to the water, very peaceful. Well equipped with everything that you could possibly need. Beautifully presented, very clean and tidy. Highly recommended.